So at the end of having my fun 15 minutes in the kitchen for once in my life, spiralizing every fruit and veggie I had in the fridge, I ended up with this really pretty salad! If anything, this awesome cooking tool makes food look prettier for serving guests too! Not being much of a cook, I never invite people over for dinner, but this handy tool makes me much more apt to extend an invite! I told my boyfriend before trying out this tool, that I wanted him to do it because he garnishes his food so pretty that I knew he would make whatever dish he created with it look amazing, but I was pleasantly surprised to find that this veggie spiralizer makes even MY food look good! 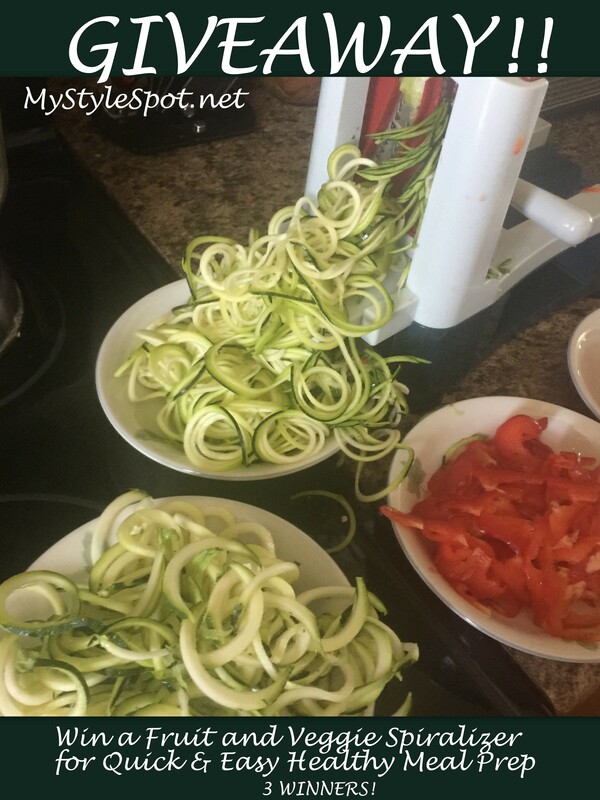 The Vegetable Spiralizer is Perfect For Making Low Carb Gluten Free Paleo Vegan Meals! Being that I’m a vegetarian, this thing should be (and probably now will be!) my best friend in the kitchen – well at least when Troy isn’t there to cook for me! The product is really good quality and you can tell it’s strong and durable and built to last too! If you’ve used previous spiralizers in the past, this one is a serious upgrade and not like those cheap, poorly made other spiralizers you’ll find on the market! The blades on this are strong, work great and are easy to clean too! 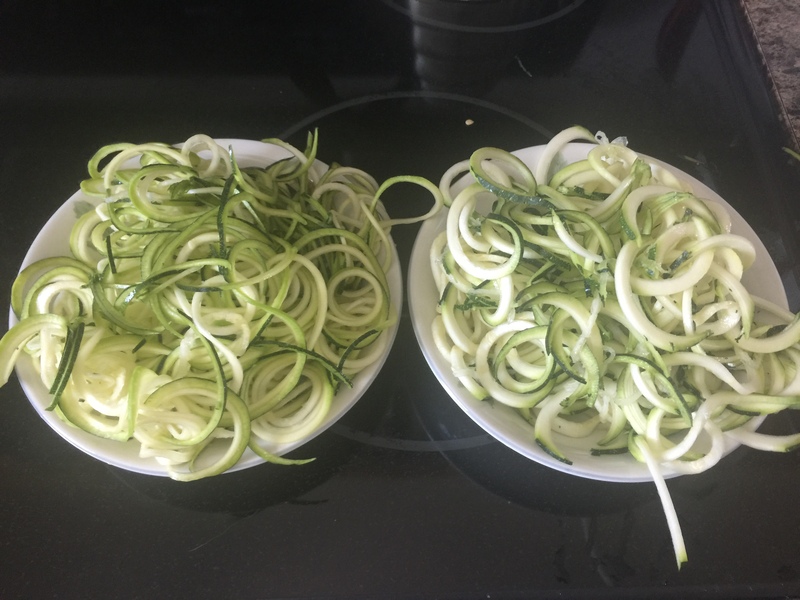 The spiralizer is super simple to use, and works really well and doesn’t require any muscle either! It’s safe enough for younger ones to use too! You can even use it with extra strong vegetables like pumpkin, squash, and beetroots! You just simply turn the arm and push towards the blade gently, and it does all the grunt work! It also has four incredibly strong suction cups on the bottom that really grip your counter, so it won’t move around on you at all, while you cut up your veggies. It grips so hard, I had to pull each leg off separately and slowly to place the spiralizer in my dishwasher to be washed. It is also BPA free and great for helping save time preparing healthy meals too! I was amazed at how quickly this handy tool spiralized up food! It’s so much easier and faster than manually chopping up fruits and veggies! It also makes it extra easier for those of us who stick to the TV dinners, to give them up and start eating a healthier, more balanced meal. And you can bet, if you’re using this thing frequently and cutting up lots of fruits and veggies with your meals, you’re going to be losing some weight too! I’m not much of a salad person, which I know is extremely weird for being vegetarian, but the pretty salad I created with this actually made me want to eat salad! It WAS yummy too! This handy kitchen tool also makes it easy for busy Mom’s to whip up some healthy meals quickly! Just spiralize some veggies, toss in the frying pan with some olive oil, cook up for a few minutes, add some rice or tofu, and you’ve got a yummy, easy, healthy meal! 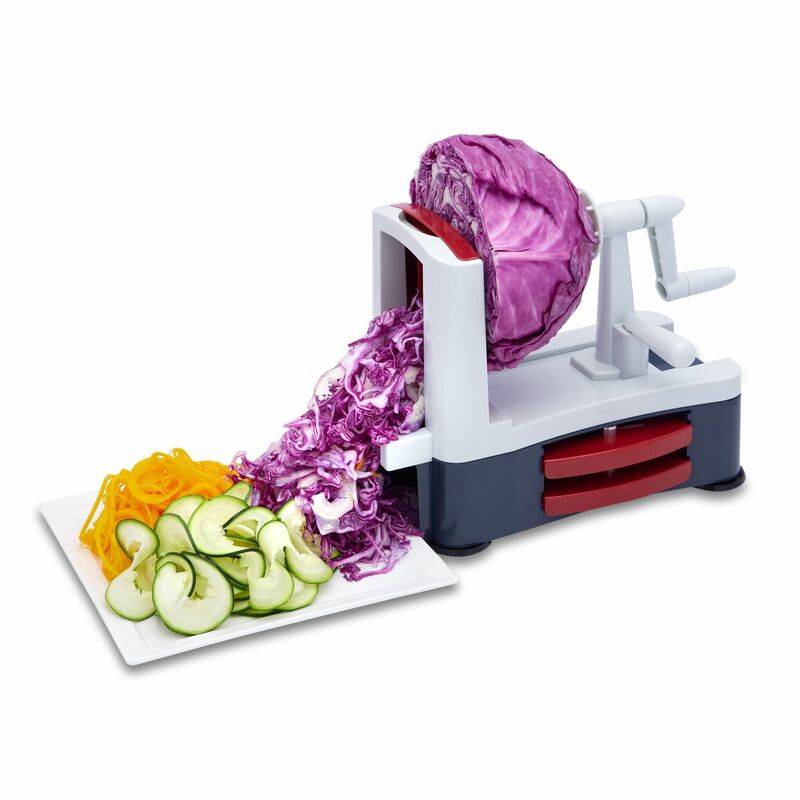 I don’t have kids but I imagine the pretty spiralized veggies you get with this thing would entice kids to actually want to eat their veggies (as well as probably play with them too though, lol.) I spiralized zucchini with this spiralizer too (as shown above) to use as a pasta dish instead of pasta. I have tried this in restaurants and have been amazed with how well zucchini can replace pasta in a pasta dish! 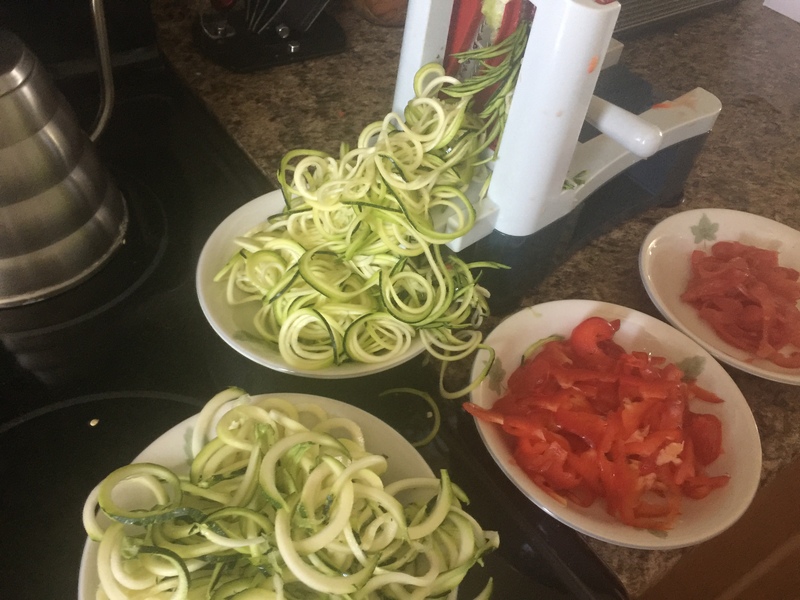 I love that this spiralizer allows me to do that and eliminate some carbs too by eating less pasta and more veggies in my dinners! 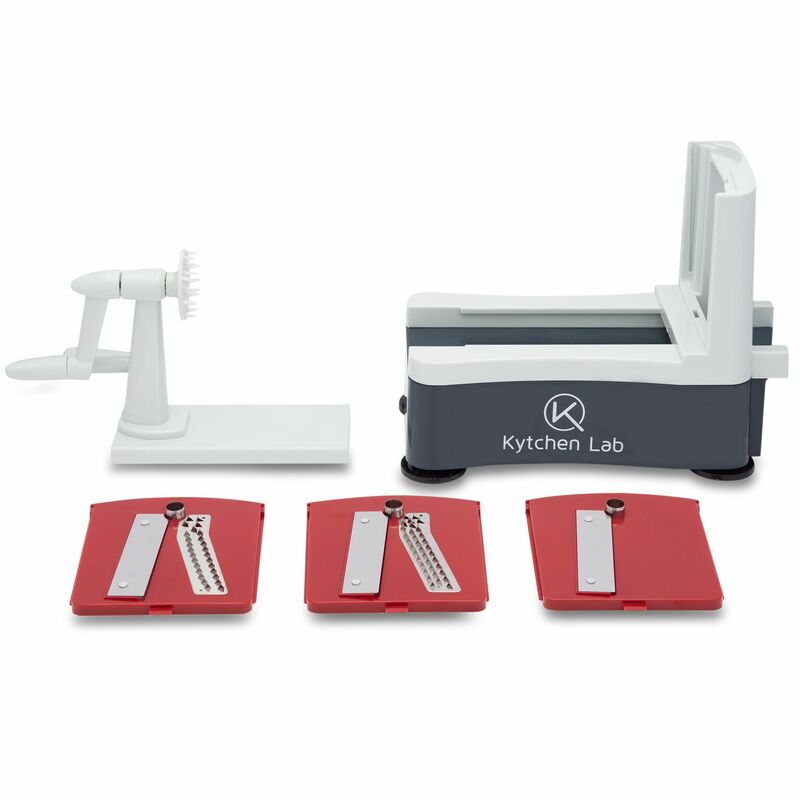 There’s no risk to buy it and try it out for yourself too because Kytchen Lab offers a 100% risk free purchase today with their Hassle Free Replacement Guarantee! Interested in trying out this super fun, and super handy Vegetable Spiralizer for yourself? Shop it HERE on Amazon. *Also, use the coupon code: OINXHGSQat checkout on Amazon and save $10! Making the price just $19.95! Valid until 7/31. One Per Customer. Also, the lovely people of Kytchen Lab are letting me GIVEAWAY one of these handy Veggie Spiralizers to 3 of my lovely readers! ENTER TO WIN A FRUIT AND VEGETABLE SPIRALIZER – to save time and easy prepping for cooking – in the Rafflecopter form below! I would use it for cucumbers! This would make prep work so easy! I would use this for squash, carrots, potatoes and anything else I could fit in it! I have a hand held that does the job but this is so much easier! I’d make Sweet Potato Curly Fries! I love spiralized sweet potatoes and this would be perfect for making those. I would try it with potatoes and zucchini first. I would use this to make a summer cucumber salad. I would use this on every veggie I could get my hands on. My mom is old and sick, it it’s hard for her to chew. I want her to eat healthier, so this would make a great way to get yams, cukes, zucchini, potatos, and especially carrots into her! I would definitely use this for cooking and garnishing. I would love to try zucchini noodles with this. I would you it to cook zucchini and summer squash noodles and some really awesome sweet potato fries. I would use it for sweet potato fries & for carrots for salads. I would first do a cuke to add to my salad.